I think this race will always have a special place in my heart. 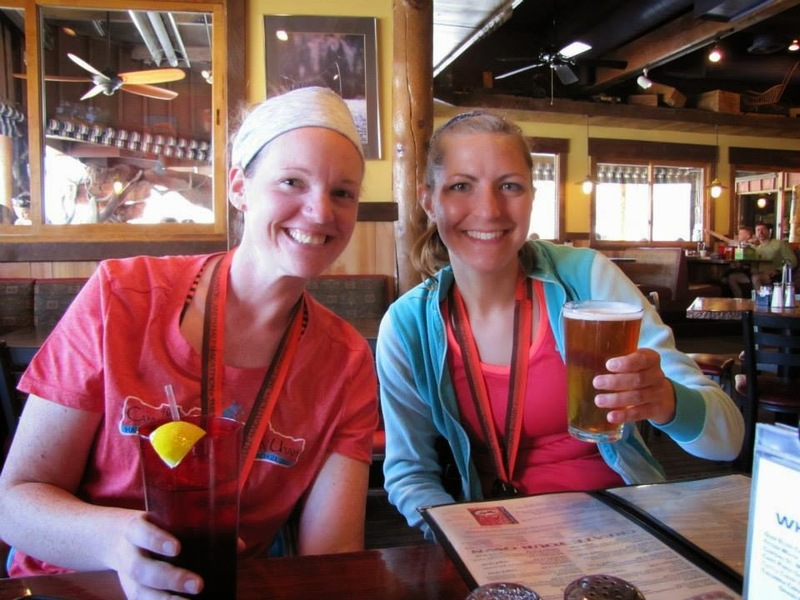 It was my first ever Half Marathon in 2013 and as such, it was also my first race that left me feeling like a "real runner". Plus you cannot beat the beauty of Moab! 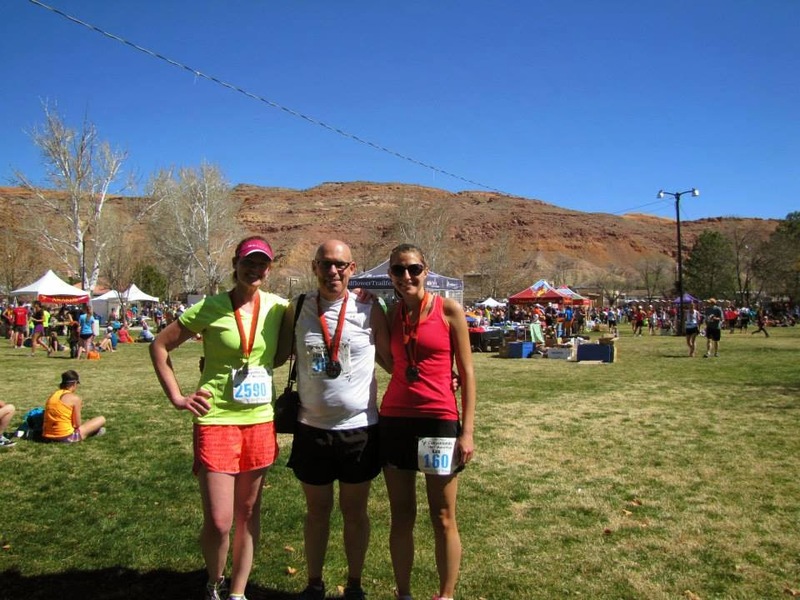 I wanted to run it again in 2014 - but was also on a quest to run my first Ultra, so I ended up running the 24 Hours of Utah 50K the weekend after Canyonlands instead. 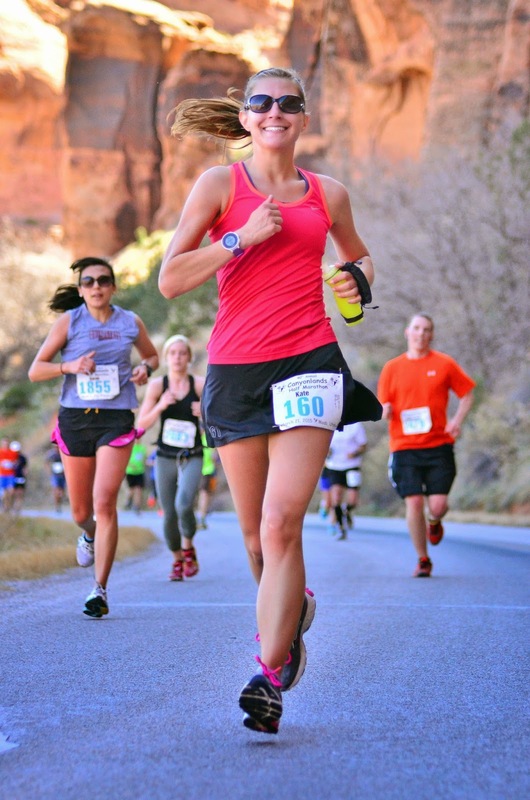 This still allowed me to get some awesome Moab scenery in (and I've officially decided Moab in March will now be an annual thing), but I was still generally bummed to have missed this specific race, so I had my sights set on doing it again in 2015. 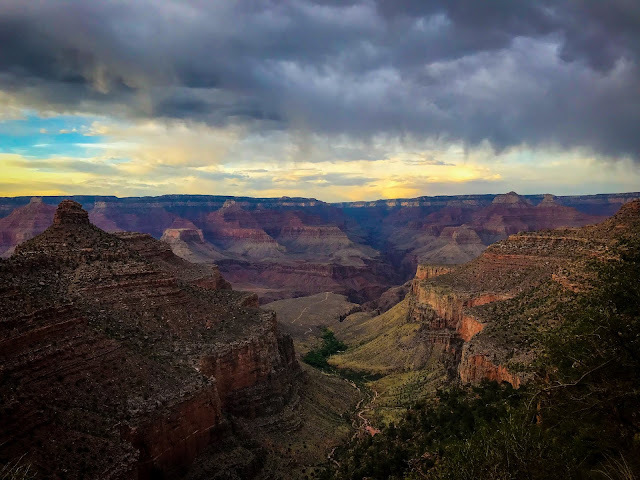 It also helped that I now live in Grand Junction so getting to Moab is only a short hour and a half drive away (one of my absolute favorite things about living here!!). This makes logistics a little easier, and with the cost of hotel rooms in Moab this time of year - also helps keep my wallet in check. 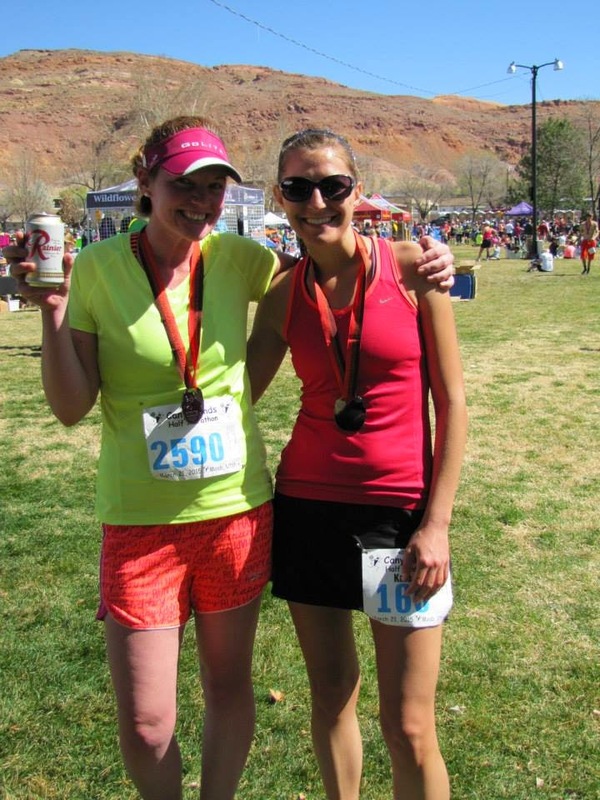 About 2 weeks before the race my friend Kellee (who did Phoenix with me!) decided to run it too - so I was even more excited to have a friend join me! Hotels by that time had sky rocketed, so she agreed to stay at my house and we would just get up early and drive to Moab on race day. Overall - it wasn't too bad. We were out of the house a little after 5:30am and made it into Moab around 7:15 - just in time for race day packet pick-up which went until 7:30. After we got our packets, we headed over to Swanny Park, found a pretty good parking spot and then got in line for the bus that would shuttle us up the canyon to the start line. As I remembered from two years ago, there's a lot of waiting around before the start. I think this is the only down side of this race - you literally have to sit around for about 2 hours before you finally get to start running. I understand why - they have to shuttle thousands of people up a narrow canyon and get the bus's off the course prior to the 5 mile race start (which is at 9:30) - but it's still a little inconvenient - as it's pretty chilly since the sun isn't up enough to reach over the canyon walls. But, different from two years ago, was that I actually had some company this year! I rode up with Kellee and then we met up with her friend (and now my friend too!) Stuart, whom she met at this very race 2 years ago (the same year I first ran it - wish I had stumbled upon them, then!). We hung out on their infamous "rock" - a very nice, flat-ish rock to sit on while waiting - that's another thing about this race: everyone claims rocks to hang out on (things runners do, lol). People waiting around on rocks! So after waiting a lot and starting to freeze, it was finally time to walk up to the start line (the bus drop-off is about 1/4 mile from the actual start line). This also meant shedding my warm layers to put them in my drop bag. It was still SO cold at this point. I knew it was going to be seriously hot once we started and the sun came out, so I didn't want to bring any of my layers with me - but it was really hard to shed them! After getting rid of our drop bags, we made our way into the masses (which was welcomed to help keep warm) and I was happy to run into several local runners I know: Tom, Jan, Chrystal, and Ammon! Walking to the start line. If you look closely, you can see WAY off in the distance. Looking back towards the race course. Finally - the gun went off! It was a little startling because they didn't announce it - it just went off, like that (despite having done this race before - since it was my first "big" race - it's all kind of a blur - so there's some things I remember well, but some things I do not). Anyways, I headed off. There's a huge down hill for the first 1/4 mile which makes "not going out too fast" a little difficult. Shortly after the start I saw another friend, Dan - so I exchanged hello's and and then I continued on. 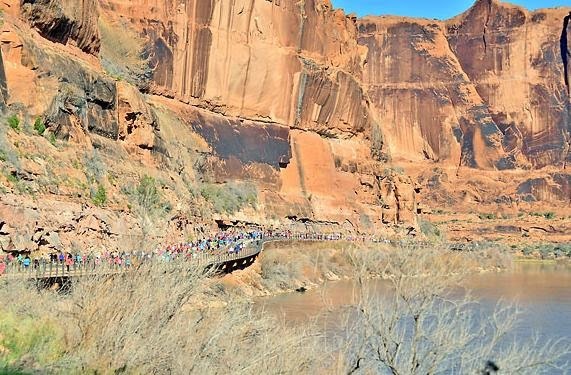 Stole this picture from MoabHalfMarathon.com - it just shows the course SO well! Not even a mile in we rounded a corner and out came the MOST intense sunshine ever! I went from comfortable (having warmed-up by now) to SO SO hot. Uh oh...this was going to be interesting. I'm not much for running in the heat in the summer, let alone when it's early spring and I have not acclimated to it AT ALL (despite the awesome wild winter we had this year!). 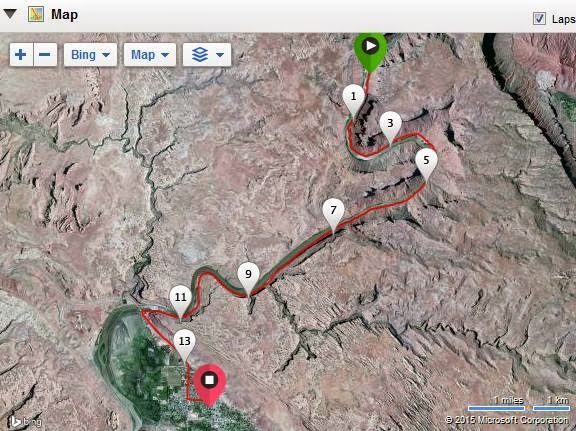 Thankfully because of the tall canyon walls, the first 10 miles ended up being in-and-out of shade depending on which way the road curved (this I didn't know - as it was overcast in 2013 when I ran it - so sun wasn't a problem) so that provided SOME relief. Despite the heat, the first few miles went by really quickly - and also probably a lot faster than they should have been: 7:38, 7:39, 7:36, 7:47. Around mile 5, I knew I wasn't going to be able to sustain the pace I started out at. That combined with the heat had me seriously doubting whether I could PR today. I honestly wasn't sure going in whether I could or not - but I was trying to remain positive. As you may recall I had a HUGE PR (1:44:17) back in January when I ran the Prairie Dog Half Marathon in Louisville. 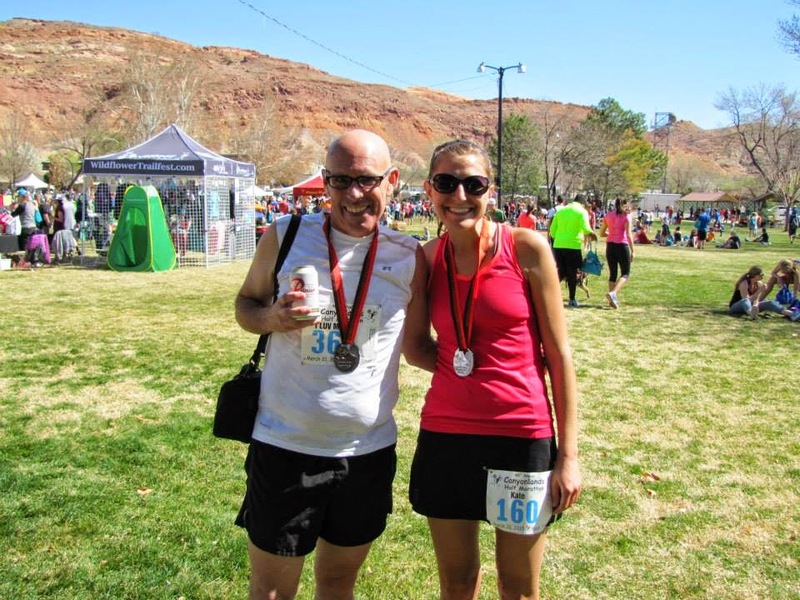 When I first signed up for Canyonlands, I was sure I could PR - because the course is much easier than the Prairie Dog Half. However, I decided to take a lot more rest and recovery than originally planned after the Phoenix Marathon. I didn't want to risk injury, so I literally had not done any fast running since Phoenix which was 3 weeks prior. Because of that, going in I was kind of at a toss up. But I figured I would go for it and just see. And seeing I did - at about the 5 mile mark I knew a PR was going to be tough. It was still in sight at the time, but with the heat (that was only getting hotter, and would be unbearable when I got out of the canyon and lost all shade) I knew I was going to have to really work for it. I tried my best to keep my pace up as much as possible and ran the next 6 miles at around an 8:00 minute pace: 8:02, 7:53, 7:56, 8:00, 8:07, 8:16. Taken somewhere on the course. 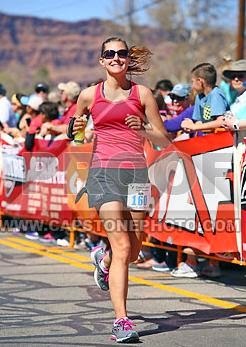 I did pay for this one - it might be my best race picture ever, so I figured it was worth it! 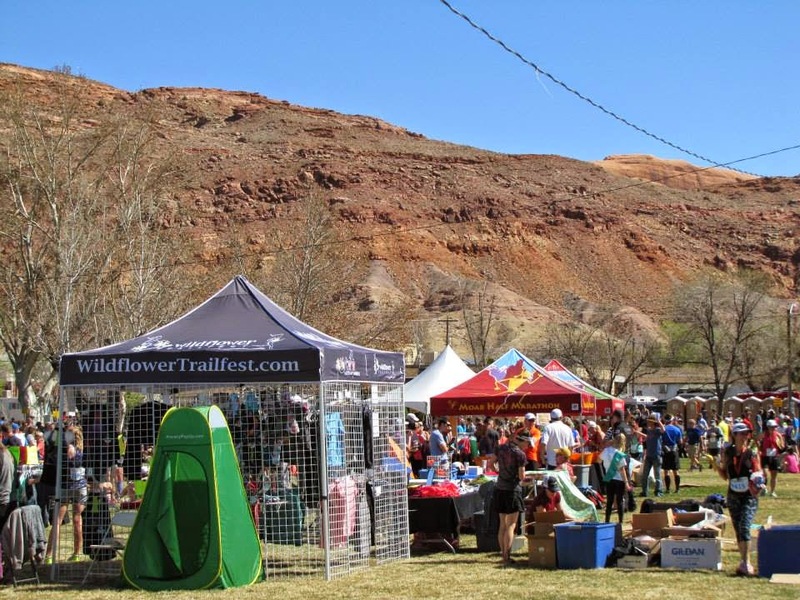 Somewhere around mile 11 is when you exit the gorgeous canyon (the reason you run this race) and get onto the worst part of the course - about a mile stretch where you're on the main road that leads into Moab - only separated from cars and trucks by a few cones. It's only 1 mile out of 13, but after running on the gorgeous, traffic free road for 11 miles earlier, it's a hard change. This is also the part where the runners who did a great job pacing themselves start passing you. Finally at mile 12 the course turns onto some residential streets until the finish line. This section is nice because there are a lot of spectators and you know you're only about a mile to the finish! Mentally I wanted to pick my speed up for this, but it really was so hot and exposed, I just couldn't. The last three miles were my slowest at: 8:21, 8:33, 8:34. I didn't even feel like I could sprint to the finish line once I got in into the shoot like I normally do - however - I will say that the fact that I can manage to squeeze out 8:30's when I'm completely exhausted and over heated is a nice relief - that used to be an insanely fast pace for me even in ideal conditions. I ended up crossing the finish line in 1:45:43 - missing a PR by about a minute and a half. I do think I went out a little faster than I should have - however with it getting hotter as the day got later, and not being used to the heat at all, I'm not sure going out slower would have helped anyways. So, overall, I am happy with this time. I pushed myself to sustain a decent pace, and without much official training over the past several weeks. However, I also think I need to start running in the heat of the day more often as it gets warmer to get used to it. My next two marathons have the potential to be very hot - especially towards the end - and I want to be prepared (or at least more prepared) for it. After I crossed the finish line, I got some water and then circled around to watch for Stuart and Kellee to come in. I missed Stuart while I was getting water, but I saw Kellee (along with several other locals I knew) come in. We went and got our drop bags afterwards and cooled off for a bit before heading to Zak's, a local restaurant, for lunch. I did miss the beer garden again this year - we were going to go in for a bit, but the line was outrageous so I had one at the restaurant instead! Kellee, Stuart, and I after the race! The Scenery is top notch: This is essentially why you run this race, so it has to be #1 on the list, but I still want to emphasize it. 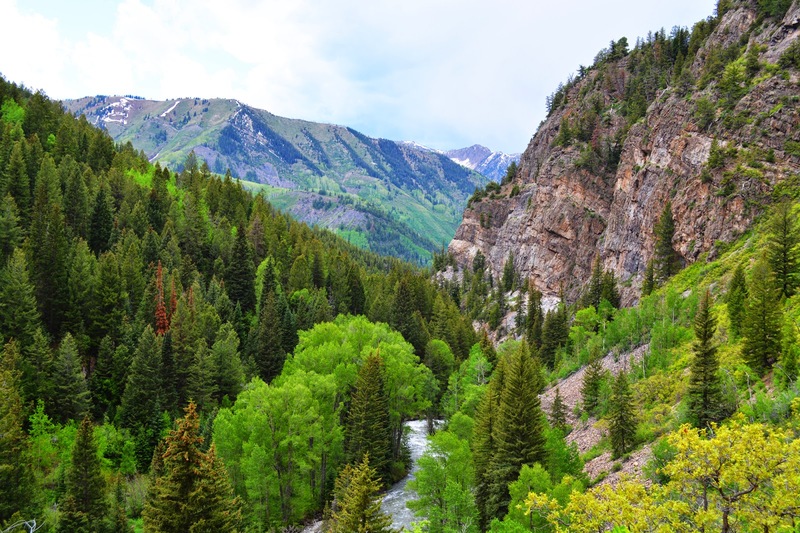 The canyon is gorgeous with the high red rock walls and the Colorado River running through it. You just can't beat it (and if you still don't believe me, watch this video). 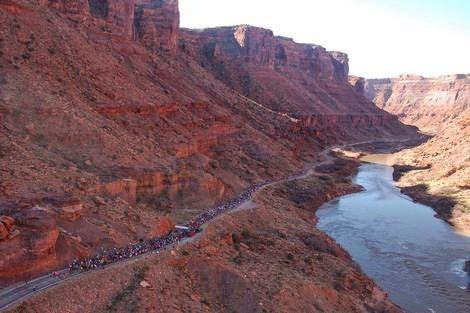 Race Organization is excellent: Moab Half Marathon does know how to put on a great race. The shuttle buses are smooth, the starting line is well organized with plenty of porta potties, the gear bags are easy to drop off and pick up. I have complained in the past about the cost of this race (this was actually one of the reason's I didn't do it last year), but when I truly think about everything they have to do - from shuttling runners to closing off the entire highway, it makes sense and I do think it is worth it. Great SWAG: Despite the shirts not being excellent (see below), everything else was great. I love the reusable shopping bags for gear bags, we got a special "40th Year" sticker, and the medals were awesome this year! SO HOT. Nothing the race organizers can do about this and I know it can vary from year to year, but just a comment. This year it was held about a week later than normal and I wonder if that also contributed. Beer Garden: they really need a larger beer garden - the line was so long my group did not want to wait. It was full, and so race officials were not letting new people in until existing people left. And apparently the race gives out up to 3 free beers...which I think was the problem: people were sitting around in the beer garden, drinking three beers and not leaving while other people couldn't even get in and so got none. It was sad and probably my only main complaint. Shirts once again were not great: this was the second time I've done this race and once again the shirt fit is weird. It is better than in 2013 (those shirts were wide and short), but this year's definitely run very large. I ordered a small and I'm practically swimming in it. Shirts aren't generally a deal breaker for me, so I wasn't that concerned, but it's always a nice bonus if they do fit! Long, cold wait for the start: again - not much can be done about this - just something to keep in mind if you plan to run this race. It is definitely one that you want to use your drop bag for (or bring throwaway clothes). And the million dollar question: Would I run this again? I honestly don't run that many repeat races just because there are SO many races out there to try - so I've decided to add this question to the end of every race report. Today's answer is: YES! In fact they're offering early bird pricing through the end of the month, so I went ahead and jumped the gun to sign up for 2016's race. It's just such a fun race and a great way to kick start the racing season. Finally got my Beer - thanks Stuart! Views from the drive home! Last... I am SO excited to announce that I was selected to be a Skirt Sports Ambassador for 2015! I truly love this company and am so honored to be selected for this role! Not only are their clothes awesome, but they are local (based out of Boulder) and have such an awesome message: empowering and inspiring women of all ages, shapes, and abilities to live a healthy and active lifestyle. I just think this is SO important. Before I started running, I was so intimidated by athletic people (in fact, I would have been extremely intimidated by myself if I had met me just 5 years ago! ), but I've learned so much since I started running. Being active and finding a passion for something you love to do can be so good for you both physically and mentally! I've said it before and I'll say it again - running has truly changed my life for the better! I hope I can help inspire and encourage people in this role! Take 20% off your Skirt Sports order with code "SSMAA20"